1.This Staff Working Document provides analysis and evidence to complement and underpin the four key priorities set out in the Commission's Communication on A renewed EU agenda for Higher Education. ·A detailed analysis of the results of the public consultation on the review of the EU's modernisation of higher education 2 . 3.After providing a review of the main channels through which higher education systems in Europe contribute to economic and social development, this document analyses four key challenges identified in the accompanying Communication. For each of the challenges, the analysis highlights available evidence of internal or external factors that are affecting, or are likely to affect, the performance of higher education systems in the area concerned, before examining examples of promising approaches to tackling these issues. 4.Higher education has a unique role to play in building successful, inclusive societies. Through their educational activities, higher education institutions (HEIs) equip students with advanced knowledge, skills and competences, contributing to society's stock of human capital and promoting social mobility and inclusion. Through research and development activities, individual academics, research teams and institutions create new knowledge, develop solutions to societal challenges and lay the foundations for the innovations of the future. And through cooperation with business, the public sector and civil society, universities and colleges strengthen the economic, social and cultural fabric of the localities and regions where they are located and drive innovation in many types of setting. 5.From a human capital perspective, effective higher education systems need to respond to demand for highly skilled people in developed economies that is increasing and changing. The growth of the service sector and relative decline of mass manufacturing has increased the number of knowledge-intensive jobs in the economy. At the same time, with greater automation and digitalisation, the tasks associated with specific occupations are frequently becoming more complex 3 . 6.Largely as a result of these trends, CEDEFOP predicts that half of all job opportunities 4 that will become available in the EU in the period up to 2025 – as a result of new job creation and to replace those leaving the labour market - will require high-level qualifications 5 . CEDEFOP estimates an additional 16.3 million jobs will be created in the EU for tertiary graduates in the period up to 2025, while employment is predicted to fall significantly in jobs assumed to require low qualifications and slightly in jobs requiring medium qualifications. 7.Shifts in the structure of European economies and the nature of specific job profiles and occupations are going hand in hand with an increase in part-time, temporary work and self-employment – at the expense of 'traditional' permanent, full-time employment 6 . This trend also has implications for the skills needs. As jobs become more flexible in form, as well as complex in terms of content, a higher proportion of the population needs a broader set of high-level skills to allow them to adapt to, and operate effectively in, the new reality of work. Open and flexible learning is one of the various ways in which higher education institutions can support the workforce to upskill and reskill, in a cost-effective and flexible way, in order to meet the requirements of an ever-changing job market 7 . 8.Capacities to process large amounts of information, make critical judgements, communicate and cooperate effectively, think entrepreneurially and adapt rapidly to changing contexts are more important than ever. A highly skilled population is important not just to allow Europe to react to a changing environment, but also to shape and seize the opportunities of a modern, knowledge-based economy. The same competencies are equally relevant for engaged participation in civil society. 9.Alongside their role in education, Higher Education Institutions concentrate almost a quarter of the EU's total public and private spending on research and development 8 . The results of frontier and applied research contribute to the stock of human knowledge and provide pointers for solving major economic, social and environmental problems. 10.As knowledge institutions, HEIs are increasingly embedded in broader innovation eco-systems at national and regional level. Contributing to innovation and economic development has become a goal of universities and colleges across Europe. Commercial spin-off companies, technology transfer activities and networks of cooperation with businesses, government and public services have become widespread. 11.However, the mechanisms through which such activities contribute to the product, service and organisational innovation that boost productivity within the wider economy are – like innovation as a whole - complex and unpredictable. There is a broad consensus that innovation does not result from a linear 'pipeline' leading from research and development to the marketable products and services, but rather from a dynamic system of interactions and feedback loops linking different actors in particular contexts. This makes 'innovation' virtually impossible to plan. Instead, policy makers and practitioners – including those in higher education – are increasingly focusing on creating favourable conditions for entrepreneurial thinking, networking, creativity and risk-taking. As a recent paper by the European Political Strategy Centre put it: 'our innovation economy is not a Roman aqueduct, but a muddy pond ... Innovation requires of all actors, corporate, academic, civic and political, the instinct of the hunter-gatherer, not the farmer' 9 . 12.While the contribution of higher education to innovation in the wider economy has long been, and remains, a core part of higher education's 'third mission', higher education institutions are increasingly giving more emphasis to their wider social responsibility to the communities in which they are located. The notion of the 'civic university' is sometimes used 10 to characterise institutional strategies that aim to promote mutually beneficial engagement between the community, region and the university. 13.Higher education institutions, government, business and civil society are the four sets of actors in the 'Quadruple Helix' 11 . This is an emerging model of cooperation for higher education institutions, with a strong emphasis on broad patterns of cooperation in which different sets of actors 'co-produce' new ideas, solutions to problems. In comparison to more established models of innovation and cooperation, the Quadruple Helix, focuses to a greater extent on the involvement of citizens and communities and on promoting positive change in a wider range of settings (social innovation, environmental improvements, community cohesion, as well as the development of new products, services and processes in enterprises). 14.Alongside the wide-ranging – and far-reaching - impacts of higher education on skills development, knowledge creation, innovation and social cohesion, higher education institutions have a range of even more direct effects on the localities and regions where they are located. Recent work in a number of EU countries has also focused on measuring the direct economic impact of higher education 12 . A study commissioned by the League of European Research Universities (LERU) in 2015 13 estimated that the 21 LERU universities contributed more than €55 billion Gross Value Added (GVA) to the European economy and supported around 900,000 jobs 14 . When the earnings premium associated with one year’s cohort of graduates was included in the calculation the contribution of the 21 universities increased to €71.2 billion GVA. The authors argue that extrapolating this impact across the whole research universities sector (thus not including other parts of the higher education sector) across Europe suggests that the sector contributes over €300 billion GVA per annum and supports 3.8 million jobs across Europe. This is equivalent to 2.2% of the total GVA of the European economy and 1.8% of all European jobs. 15.The expansion of higher education in recent years is one of Europe's success stories. Progress in relation to the EU's Europe 2020 headline target that 40% of those aged 30 to 34 should have a tertiary qualification or equivalent by 2020 15 has been significant. Just over 39% of 30-34 year olds had a tertiary education qualification in 2015, compared to 28% ten years earlier. This indicator takes into account all types of tertiary education qualification, from two-year short cycle courses to doctoral qualifications 16 . As shown in Figure 2.3, tertiary attainment rates among young people vary considerably across the EU, from just over a 25% in Italy and Romania to over 50% in Lithuania, Cyprus, Luxembourg, Ireland and Sweden. Source: Eurostat (EU-LFS, special extraction, 2016). Note: The indicator covers the share of the population aged 30-34 years having successfully completed tertiary education (ISCED 5-8), broken down by type of degree. Country notes: Small, and therefore unreliable, sample sizes for short-cycle attainment have been included in bachelor attainment for CZ, EE, IT, PL, RO, SK. Small, and therefore unreliable, sample sizes for doctoral attainment have been included in master attainment for BG, EE, LT, PT, RO, FI. 16.Despite the considerable increase in the number of people with a tertiary qualification flowing into the EU workforce, at aggregate level, tertiary graduates are still more successful than their peers with lower levels of qualification at securing and maintaining employment. The average employment rate of recent, young tertiary graduates 17 in the EU in 2016 was 82.8%, compared with 72.6% for those of the same age who had recently completed upper secondary or post-secondary, non-tertiary qualifications (i.e. those with at most a high-school or further education diploma). The equivalent figures for 2008, before the full impact of the financial crisis was felt, were 87% for tertiary graduates and 77% for upper secondary and post-secondary, non-tertiary leavers. 17.While the headline employment rate of young tertiary graduates in most Member States has been comparatively robust in the wake of the crisis and is beginning to increase again, the underlying picture is more nuanced. In particular, an increasing number of young tertiary graduates are working in jobs which do not fully use their qualifications and skills. The recent European Skills and Jobs Survey found that, in 2014, up to 25% of young employed tertiary graduates (aged 24 to 35) considered themselves to be overqualified for their jobs 18 . This finding in part reflects individual choices by graduates to take lower skilled jobs, but also highlights the difficulties some sections of the graduate population have had in moving into the labour market in a difficult and evolving economic environment. 1.A mismatch between the high-level skills Europe needs and the skills it has: many parts of the EU are experiencing shortages in certain high-skill professions,, both in terms of qualifications and the quality of the associated skills. At the same time, too many graduates leave higher education with poor basic skills (literacy, numeracy, digital) and without the range of transversal skills (problem-solving, communication, etc.) they increasingly need for resilience in a changing world. 2.Persistent and growing social divisions, which also affect higher education: people from disadvantaged socio-economic and migrant groups remain far less likely to enter and complete higher education, while academics and graduates are too often perceived as detached from the rest of society and the communities where they are located. 3.A gap between the potential contribution of higher education to innovation and the reality on the ground: despite their expertise and capacities, higher education institutions are not contributing as much as they could to innovation in the wider economy (private and public sectors), particularly at local and regional level. 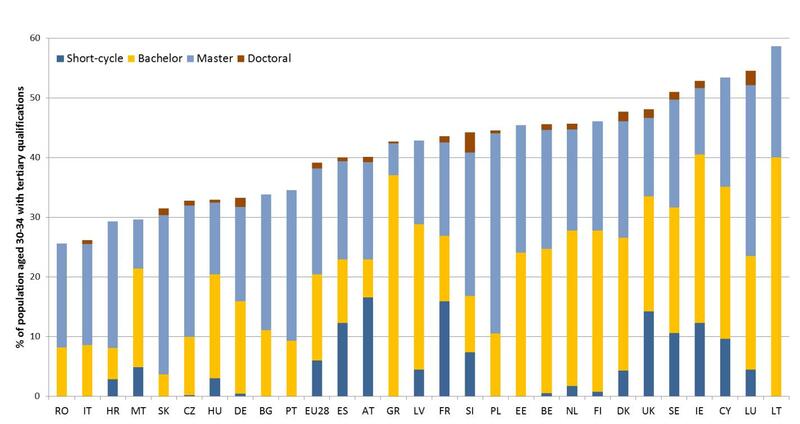 The performance of higher education in research and research capacity varies strongly between EU regions. 4.Higher Education systems that are often fragmented and governed in a piecemeal rather than holistic way: funding, incentive and reward mechanisms in higher education are not configured to reward good teaching and research, encourage innovation, social inclusion and engagement in a balanced, effective and efficient way. 19.While each challenge has its own specific elements, they are clearly interconnected and have to be tackled as such. For example, social divisions and links between HEIs and their surrounding communities can be addressed with innovative solutions; the harnessing of innovation can require the upgrading of skills; and the role of HEIs in local and regional development is strongly affected by nationally designed higher education systems. 20.The following sections of this document review the evidence around each of these challenges and provide a synthesis of some of the most promising policies and practices being developed to address these challenges in Europe and elsewhere. 21.Assessing the extent to which higher education systems equip students with the knowledge, skills and competences they need is complex. 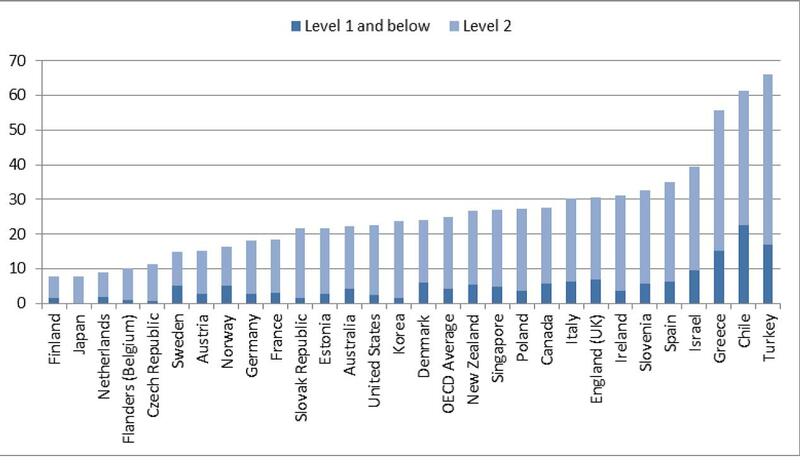 In the schools sector, national examinations in many countries and international assessment exercises such as the OECD's Programme for International Student Assessment (PISA) exercise make it possible to compare certain aspects of students' skills levels and thus the extent to which schools are effective in helping them to acquire desired learning outcomes. No equivalent national or international skills assessment exercises currently exist at higher education level, even if projects are being developed to fill this gap in Europe and elsewhere 20 . As a result, our assessment of whether students are actually leaving systems with the right skills has to be based on a range of other indicators, including evidence from the labour market (employment trends and feedback from graduates and employers) and data from more general assessments of adult skills 21 . 22.The evidence on how well higher education is currently performing in terms of equipping graduates with skills is mixed. One of the only comparative surveys of employers in the EU in recent times found that a large majority (89%) of employers who had recruited higher education graduates in the past five years agreed that these graduates 'had the skills required to work in their company', albeit with significant variation between Member States 22 . In contrast, in their responses to the online public consultation 23 undertaken in preparation for the new Commission Communication on higher education, 71% of students or recent graduates and 61% of higher education institution employees disagreed with the statement that "there is a good match between the supply of higher education graduates and the knowledge and skills the economy needs". 23.Underlying these kinds of general statements are two main concerns: shortages of tertiary graduates in specific fields of knowledge and a more general concern about the broad set of competencies all graduates need and whether or not higher education is helping them acquire these. A recent JRC CRELL 24 report analyses the evolution of skills over the lifetime of individuals and across generations for a number of EU countries, using data from PIAAC and its predecessor, IALS. The report finds that literacy skills decline with age after the end of formal education; in several countries, more recent birth cohorts exhibit lower levels of literacy than previous generations. This raises concerns about a possible decline in the effectiveness of education systems in providing younger generations with an adequate level of skills. 24.Based on analysis of quantitative and qualitative evidence from national labour markets, including skills need forecasts, CEDEFOP's Skills Panorama 25 has identified 'shortage occupations' in each EU Member State. Across the EU, the most frequently occurring shortages are in professional and associate professional occupations at high skills levels and for which a tertiary qualification is generally required. The top five are ICT professionals; medical doctors; 'science, technology, engineering and mathematics (STEM) professionals' 26 ; nurses and midwives; and teachers (see Figure 3.1). 25.For the areas of ICT and STEM, the analysis undertaken for the Skills Panorama finds that shortages are driven by a combination of growing demand, too few young people enrolling to study STEM (including ICT) subjects in higher education and a particular under-representation of women in these fields (see below). Moreover, in some countries and fields, there is evidence that STEM graduates go on to work in 'non-STEM' occupations, where they find better working conditions. The shortages in the medical professions are frequently linked to increased demand from an ageing society, restrictions on the numbers of study places and, in some countries, emigration of trained medical professionals. In teaching, the shortages are most often linked to an aging teaching workforce (meaning retirees need to be replaced) and, in some part of the EU, unattractive working conditions. 26.The occupational fields where the largest shortages exist correspond to a large extent to fields of study where there are the largest gender imbalances in populations graduating. 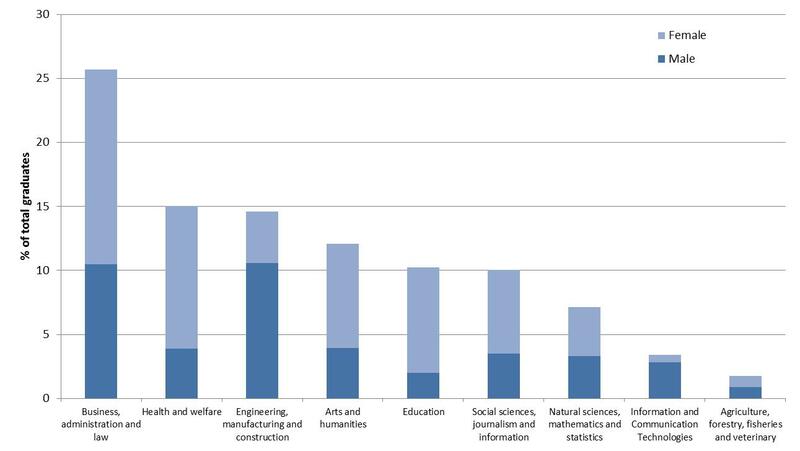 As shown in Figure 3.2, for the EU as a whole, over 70% of tertiary graduates in the broad field of 'engineering, manufacturing and construction' in 2014 were men. The proportion for 'information and communication technologies' was over 80%. In contrast, 74% of graduates in the fields of 'health and welfare' (including doctors and nurses) and 80% of graduates in education (including teachers) were women. The relative under-representation of one gender in these fields is an additional factor in the overall picture of supply and demand. 27.Addressing these kinds of imbalances and shortages in high-level occupational skills is not, and cannot be, the sole responsibility of higher education systems. Other sectors of education and training, employers and government all have their role to play in helping to increase the flow of students into shortage study fields and creating attractive working environments for graduates. Higher education systems do need to play their part in ensuring adequate provision of places for education in shortages fields, developing programmes which develop a broad range of subject-specific and generic skills and helping to tackle the gender stereotypes associated with key shortage occupations. …and growing demand for transversal skills. 28.The increasing complexity of many high-skill jobs is one of the factors behind an increasing focus on the importance of generic, 'soft' or transversal skills in discussion of skills needs. Technological change has to date had most impact on routine tasks that are easily programmable and interactions that do not require person-to-person interaction. Person-to-person services and occupations relying more on creativity, context adaptability, task discretion, social skills and tacit cognitive capacities have been – and are likely to remain - less affected 27 . 29.Several surveys of employers point to increasing demand for these kinds of attributes. The 2014 European Skills and Jobs Survey 28 , for example, highlighted the increased complexity of jobs, particularly at the top of the occupational scale, with 80% of managers and over 70% of professionals and associate professionals reporting a rising variety of tasks in their jobs. The same survey identified advanced literacy, learning, adaptability, persuasion and ICT skills are the skills for which demand is increasing most. 30.As noted, the evidence on the extent to which today's tertiary graduates actually possess the kinds of skills needed to thrive in a changing economic environment is limited. Alongside high employment rates, across the EU, tertiary graduates also continue to enjoy higher earnings that their counterparts with lower levels of educational attainment 29 . This suggests that graduates' skills are still strongly valued and rewarded on the European labour market. Nevertheless, there are signs that a – sometimes significant - proportion of graduates are leaving higher education with comparatively poor generic skills levels. 31.On the basis of a wide-ranging survey of young people, education providers and 2 600 employers across Europe, a recent report found a widespread perception that education and training systems at all levels are not equipping students with the skills they need. The report concluded that 'too many students are not mastering the basics, with businesses reporting a particular shortage of “soft” skills such as spoken communications' 30 . 32.More worryingly, the OECD's Survey of Adult Skills (PIAAC), undertaken in 2012, provided an assessment of literacy, numeracy and problem-solving in technology rich environments among the adult population in OECD countries. The assessment revealed a significant share of young tertiary graduates with literacy skills below level 3 on a scale of one to five, ranging from under 10% in Finland to over 30% of the sample tested in Ireland, Slovenia, Spain and Greece. This suggests that many graduates would have difficulty in 'performing multiple-step operations to integrate, interpret, or synthesise information from complex or lengthy texts' 31 . These data focus only on literacy, but do raise questions about the wider set of skills with which some graduates are leaving higher education. 33.An overview of the incidence of skills and education mismatch in EU countries, based on PIAAC data, is provided in the JRC report Flisi et al. (2014) 32 . The study highlights the importance of carefully conceptualising mismatch, because education and skill mismatch do not measure the same phenomenon. The report shows that only a small percentage of individuals are mismatched with respect to both education and skills, whereas the majority are mismatched with respect to either education or skills only. Pellizzari et al. (2015) look at skills mismatch in the domain of problem solving in technology rich-environments (i.e. 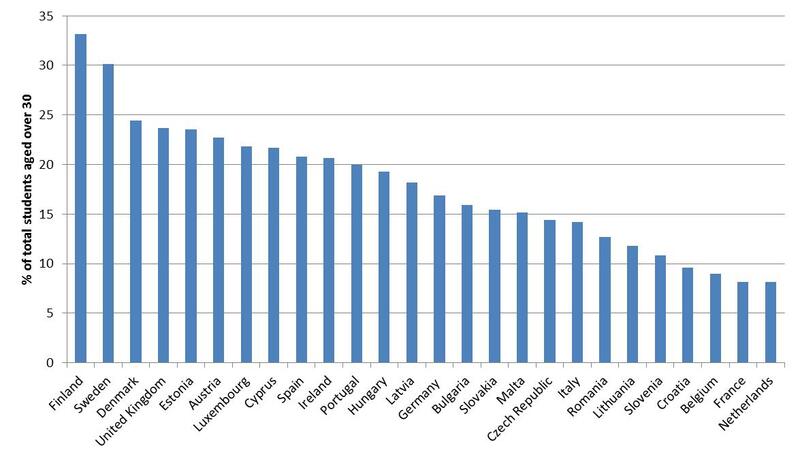 digital skills) using PIAAC data for the 13 countries of the European Union (plus the US) for which data are available. Their results indicate that, on average, about 87% of the workers are well-matched 33 , about 10% are over-skilled and 3% under-skilled. Significant differences among EU countries emerge. ·Support for teaching staff in higher education. 35.In order to design and implement effective higher education provision, which is relevant to the needs of modern society, practitioners and policy-makers need an informed understanding of how high-level skills needs are evolving and how well higher education is already doing in preparing graduates for an evolving world of work. 36.Skills forecasts and analysis of skills shortages, such as those undertaken at European level by CEDEFOP 34 , provide a valuable input for those in charge of steering higher education systems and developing programmes to meet demand. At national level in the EU, a recent report found authorities in nine EU countries regularly use labour market information in the planning and management of higher education 35 . While these kinds of exercises provide a general picture of the state of play and the direction of travel in terms of skills needs, they need to be complemented by more qualitative and fine-grained intelligence. Current and future skills requirements are increasingly a topic for structural cooperation and dialogue on between higher education, business and public sector employers at national and regional level in the EU, although patterns of cooperation vary considerably across the EU 36 . 37.In parallel, progress is being made in assessing how well higher education prepares people for life – in work and beyond – through using graduate tracking information to analyse the way graduates enter the labour market after graduation and subsequently progress professionally and personally. 'Graduate tracking' is a term that covers a range of different methods used to collect factual information about graduates and their status, as well as qualitative feedback and opinions from graduates themselves. The most commonly used approaches to tracking graduates rely on different forms of administrative data (from education, tax and social security databases) and/or dedicated graduate surveys conducted at system level or by individual higher education institutions. 38.What graduates do after graduation is naturally influenced by economic circumstances - in particular, the state of the economy in the place where they go on to live - and personal life choices. However, it is clear that what people study, where and how they study and what they learn also influence their subsequent development. Information on graduate outcomes and feedback from graduates can thus be valuable for education providers, policy makers and those involved in guiding future students in their study choices (see also next section). 39.In Europe, many countries are currently in the process of developing or refining the mechanisms they have in place for graduate tracking. This means the situation on the ground is constantly evolving. Recent studies suggest, however, that more than half of the 33 EU and European Economic Area countries have some form of regular tracking mechanisms for tertiary graduates in place at system level 37 and a little under half use some form of system-wide graduate surveys 38 . In the last decade, most EU countries have also introduced systems to collect data on the transitions to the labour market of graduates from vocational education and training 39 . Current national tracking systems in Europe, in so far as these exist, do not generally collect data that can be compared directly with data from other (higher) education systems, in particular because of different definitions of variables and sample populations. This is one of the key reasons why the recent Eurograduate feasibility study 40 has recommended that a European graduate survey would be able to deliver valuable additional, internationally comparable information to complement data from national graduate tracking exercises. ·Subsequent rounds of surveying every four years. 40. 'Upstream' actions focused on prospective students are an important element in coordinated approaches aimed at ensuring more graduates leave higher education with relevant skills. New students need to be as well prepared as possible for the learning challenges within higher education and to be in a position to make a well informed choice about which subjects to study. 41.Systematic cooperation between higher education institutions and schools and Vocational Education and Training providers is important to build understanding between those working in different parts of the education and training systems, as well as familiarise prospective students with the reality of higher education. Such cooperation is promoted in several EU Member States as part of wider efforts to increase the interest of school and VET students in further study in fields where shortages exist, in particular in Science, Technology, Engineering and Maths (STEM). National STEM promotion bodies, such as the National Platform Science and Technology in the Netherlands 41 , facilitates inter-sectoral cooperation between educational providers at different levels, employers, sector organisations and government with the objective of stimulating interest in, and uptake of, scientific subjects in which the country has a skills shortage. The promising results of this and other national STEM promotion bodies have encouraged the creation of the EU STEM coalition 42 , as an EU-level platform for sharing good practice. 42.Recent decades have seen a shift in higher education towards designing programmes and curricula to help students acquire pre-defined learning outcomes. This move towards greater student-centred learning and a growing concern with graduates' employability, as well as broader learning experience, have triggered a change in the way curricula and pedagogical approaches are designed 43 . The Bologna reforms implemented from 1999 onwards 44 have also been instrumental in increasing attention to the acquisition of transferable skills- or "soft", "generic" or "21st century" skills alongside subject-specific skills across European higher education. Teaching staff and institutions are increasingly focusing on the design of learning, with detailed consideration of the pedagogical techniques that are most suitable to teach a particular subject and to reach the desired learning outcomes. 43.On campus, there has been an increased focus on problem and inquiry-based learning, where students apply knowledge to develop responses to specific (often real-world) problems. At the same time, through blended learning 45 and 'flipped classroom' approaches 46 , technology is increasingly being used to allow classroom and laboratory time to be spent on interactive activities, problem-solving and discussion, rather than absorption of knowledge. In a 2015 survey undertaken in France, Germany, Poland, Spain and the UK, 72.1% of universities stated that they used blended learning at Bachelor, Master or doctoral levels and 43.4% stated that they had implemented a flipped classroom 47 . More inter-disciplinary programmes or options for inter-disciplinary study combinations, including those that combine arts and sciences (STEAM - Science, Technology, Engineering, Arts and Maths), have been introduced in many universities. There are also approaches, particularly in research-intensive universities, which seek to involve undergraduate students more closely in the research undertaken in the institution where they study, with a view to both improving the research and developing students' interest and skills in research 48 . 44.Alongside moves to change the way learning is structured inside the walls of higher education institutions, there are ongoing discussions about the best way to incorporate 'external experience' – in particular work-based learning and international mobility – into programmes to enrich students' skills development. 45.These changes are primarily happening within individual departments and higher education institutions. However, governments and system regulators are increasingly paying attention to effective learning environments and the organisation of learning in their strategy, as illustrated by the most recent Dutch Higher Education Strategy 49 . 46.One aspect of the drive to modernise higher education has focused on the use of digital technologies to stimulate innovation, personalisation and wider access to higher education. This encompasses the use of technology, highlighted above, to change the organisation of learning within traditional higher education settings, as well as the provision of new types of online or blended advanced learning course. It involves established higher education institutions, changing their existing activities or developing new ones, and new actors – in particular private companies – from outside the traditional world of higher education. Open and online learning promotes multiple ways of teaching and learning, building and sharing knowledge, widening access to education, as well as connecting formal and non-formal learning. The JRC's OpenEdu Framework proposes 10 dimensions in which higher education institutions can become more open and modernise education via the use of digital technologies 50 . 47.While the European University Association's 2015 Trends report 51 found that digitalisation is one of the key issues on HEIs' agendas and much is already happening in the field, 45% of those responding to the Commission's online consultation in 2016 expressed concerns that technology is not yet being used effectively to improve teaching and learning in higher education 52 . Within existing higher education institutions, digitalisation is seen primarily as a tool to enhance the quality education, face-to-face teaching and to improve assessment methods 53 . Expansion on online courses and the 'unbundling' of educational programmes into smaller courses that can be delivered online are also seen as a means to widen access to higher learning, particularly for those already in the labour market. 48.To date, use of technologies for learning and teaching has primarily depended on individual departments and teachers. Institutions have invested in technology, but often not as part of a coherent digitalisation strategy. Furthermore, while the potential of technology to support effective, interactive and inter-disciplinary learning approaches is considerable, there is evidence that blended or online formats are not always being used for pedagogical innovation. Many online courses simply transfer traditional lectures to an online platform 54 . 49.Following initial hype that peaked in about 2012 55 , global interest in, and take up of, Massive Open Online Courses (MOOCs) is growing. The private MOOC platform Coursera has 22 million registered learners, while Udacity has developed new forms of 'nanodegrees' in technology-focused areas in partnership with employers, using a paying model with incentives for timely completion 56 . Much of the content for MOOCs available today is provided by established higher education institutions 57 , with staff drawing on elements of existing programmes to create short courses that result in 'microcredentials'. In a 2015 survey undertaken in France, Germany, Poland, Spain and the UK, 22% of HEIs declared that they were offering MOOCs and 19% were planning to do so 58 . 50.This process of 'unbundling' of educational content into smaller components has been likened to the developments in the music industry, with the shift from selling albums to selling songs. The short courses created are easier for people already in work to access and absorb, and are often followed also as a means of lifelong learning by (educated) individuals who are either unemployed or low earners. However, it is far from clear to what extent such provision can replace the experience of a three or four-year degree for most students. Moreover, question marks remain over the optimal role of higher education institutions in providing online courses. While established institutions, with their academic record, are still seen as necessary to guarantee the quality of courses in most cases, it is not always easy to combine the dynamics of fast-changing online provision with the structures in place for providing on campus bachelor and master's degrees. This thus remains an evolving area. 51.Changing the way learning and teaching are carried out requires committed and informed teaching staff. Some countries and/or individual higher education institutions are establishing national agencies to support institutions and staff to improve the design of their courses, their teaching skills and to support them in using technology to improve teaching and assessment. Examples include the Higher Education Academy in the UK, SURF in the Netherlands and the PULS Pedagogical Development Centre in Norway. At the same time, national authorities increasingly require teachers in higher education to have specific qualifications in teaching. 52.Quality teaching encompasses effective design of curriculum and course content, a variety of learning contexts (including guided independent study, project-based learning, collaborative learning, experimentation, etc. ), soliciting and using feedback, and effective assessment of learning outcomes. It also involves well-adapted learning environments and student support services. The report of the High Level Group on the Modernisation of Higher Education of June 2013 59 stressed the importance of clear strategies to support good teaching at institutional level within HEIs and adequate investment in Continuing Professional Development for staff. An Erasmus+ project lead by the European University Association is currently assessing the feasibility of additional European-level cooperation to support the enhancement of teaching in higher education 60 . 53.Recent events in Europe have illustrated both the challenges of integrating marginalised groups and newly arrived migrants and the extent to which some sections of society feel alienated from established institutions and elites. There is a growing acknowledgement that higher education must play its part in tackling social divisions and promoting more inclusive societies. An increasing body on work on the 'social responsibility' of higher education 61 , points, in particular, to the role of higher education institutions in supporting greater diversity in the groups of people they educate and employ and through breaking down real or perceived barriers between the academy and the rest of society. 54.The diversity of the student population is probably the issue most commonly discussed in relation to the 'social dimension' of higher education. At European level, in 2009, ministers from countries participating in the Bologna Process formally agreed that 'the student body within higher education should reflect the diversity of Europe’s populations' 62 . Increasing 'participative equity' – and particularly increasing participation in higher education among traditionally under-represented social groups - is firmly on the agenda in EU Member States. However, across the EU, people from lower socio-economic groups continue to stand a lower chance of gaining a tertiary qualification than their peers from better-off backgrounds. 55.Data on the social background of the student and graduate population is difficult to compare across countries, in particular because of underlying differences in the social make-up of different national populations and different definitions of social categories. However, evidence on the social background of students from individual countries taking part in the Eurostudent survey 63 illustrates the dominant pattern of current participation in higher education. 56.As just one example, Figure 4.1 shows the proportion of students in Ireland in the latest round of Eurostudent reporting that their fathers fell into one of nine standard occupational categories and compares with the proportion of men aged 40 to 60 in these occupational categories in the Irish population as a whole. The results show that the children of 'managers' are comparatively over-represented in the student body, compared to the make-up of the overall population, whereas the children of 'technicians and associate professions' and plant / machine operators' are comparatively under-represented. The data, which correspond closely to the results of similar national analyses in Ireland, show that despite the countries very high levels of participation in higher education 64 , the make-up of the student body still doesn't reflect the make-up of society. Although Ireland appears to have one of the more equitable higher education systems in Europe on this measure, the example demonstrates that large-scale expansion of access to higher education does not necessarily lead to a situation of complete 'equity'. 57.Alongside socio-economic background, age and existing occupational status have a major influence on participation in higher education. Despite an increased focus on lifelong learning in national policy frameworks, relatively few people who are already working go into or back to higher education to upgrade their skills. This all means talent is going untapped and puts an additional brake on social mobility. 58.Figure 4.2 shows the proportion of enrolled students aged 30 and over in EU Member States. These figures are affected by factors like the average time taken to complete a first tertiary qualification and the propensity of students to continue to Master's level, but also provide a proxy for participation in higher education among people entering from the labour market rather than directly from school. The highest rates of participation among 'mature' students are seen in the Nordic countries and the UK, with significantly lower rates in countries such as Belgium, France and the Netherlands. These data cover students participating in full and part-time courses leading to a standard tertiary education qualification in the countries concerned 65 . Other types of learning provision by higher education institutions, such as Continuing Professional Development (CPD) or short online courses are not included. 59.The question of the social responsibility of higher education also encompasses the broader contribution of higher education institutions to society at large. Here, two frequent issues are the real (and perceived) social contribution of higher education institutions to the wider communities where they are located and the role of higher education in providing civic values. 60.As centres of knowledge and expertise, HEIs, their staff and students have considerable potential to contribute to the broader well-being of their communities, by promoting innovation in social, as well as economic 66 , spheres. However, although more and more HEIs are actively discussing and promoting their broader social responsibility, they are doing so in a climate where public trust in public institutions is falling. Figure 4.3 illustrates the declining level of trust in national political institutions since the economic crisis. Although no equivalent data exist on trust in higher education in Europe, research from the US has highlighted that similar trends in public trust are evident in relation to higher education 67 . This implies that HEIs need not only to reflect on how they contribute to their communities, but also how they demonstrate how they contribute to society. 61.Governments and higher education institutions across the EU are developing and refining their strategies to enhance social equity within higher education and to support increased links between higher education and the rest of society. 62.In order to increase attainment levels, higher education systems need to continue to widen participation and improve completion in higher education. Improved completion rates are also an important factor for improved efficiency and returns on public investment. 63.With more students and students with more diverse profiles entering higher education, there is an opportunity to reform support measures, considering academic and non-academic aspects of institutional mission statements; putting in place more holistic systems able to cater for the individual needs throughout the study cycle. 64.Several Member States and institutions have introduced measures often centring on targeted funding such as performance-based agreements with clear targets concerning completion, specific financial support for non-traditional students, funding for institutions, regulation of access to higher education, including tracking students at risk of dropping out, and higher education reforms, including introducing a wider landscape of programmes. All measures are to allow attracting potential students and tapping into real talent regardless of educational and socio-economic background. Holistic support measures require viewing the issue of widened participation and completion an integral part of the academic mission. 65.Institutional strategies and activities – sometimes encouraged by policy in the field, other times existing despite the lack of policy – to accommodate the diversity of needs of a wider student body can also found across Europe. A common denominator for successful measures is that these incorporate both academic and non-academic support as well as monitoring and guidance of teaching and learning results throughout the study cycle, especially during the first study year. 66.Governments, higher education institutions and grassroots organisations, many comprising students and staff, have also developed many initiatives to support the integration of asylum seekers, migrants and refugees. At European level, the three priority areas of support are information sharing 68 , funding through Erasmus + and the recognition of qualifications and prior learning. 67.The concept of the 'civic university', already highlighted in Section 2, provides a theoretical model for social responsible higher education institutions engaged in the society around them 69 . 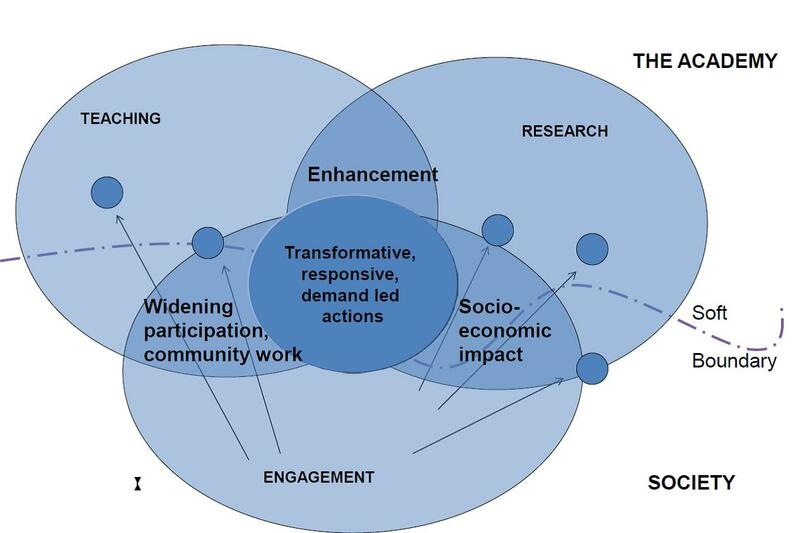 The model sees engagement with the outside world as an integral part of HEIs' activities in education and research (education, research and 'engagement' thus overlap and interact) and softens the boundary between higher education (the academy) and society. The softer boundary and increased permeability between HEIs and the world around them is conceived as mutually beneficial for the academy and society, supporting social equity goals, improved learning and teaching and enhancing the relevance and impact of research. 68.In practical terms, efforts to strengthen the interaction between higher education and 'society' often focus on the links between higher education institutions (and their communities of students and staff) and the cities and towns where they are located (and their wider communities, city authorities, businesses and civil society organisations). The EUniverCities network 70 , a network of 14 medium-sized European cities and their universities, has been established to exchange and spread knowledge, expertise and experience about city-university cooperation in Europe. The focus is on how to shape different types of cooperation between universities and the rest of the city for the mutual benefit of all parties. Through peer reviews and on-going cooperation, the network examines how effective cooperation can be developed in different thematic areas: city attractiveness and marketing; the local and regional economy; students and city life; science and society and internationalisation. 69.Responding effectively to the needs of an innovation-based economy is challenging for higher education institutions. It implies a concerted focus on nurturing the 'ingredients' for future innovation in all areas of higher education institution activity, from undergraduate education to doctoral training, research and cooperation with business and civil society. Despite the limits of our understanding of how innovation actually 'happens' 71 , there is broad agreement that highly skilled, creative, entrepreneurial people and effective cooperation networks between different organisations and across sectors are among the most important ingredients. 70.A 2016 survey by the World Economic Forum 72 , focusing on the impact of technological change, found that employers rank 'creativity' as one of the top three attributes or skills needed in the workplace by 2020. It features alongside complex problem-solving and critical thinking. To date, there has been little empirical analysis of how effective higher education is at stimulating creativity, but there are concerns about the effectiveness of existing higher education provision in this area. In the public consultation on the EU's modernisation agenda for higher education, fewer than half of respondents overall and fewer than 40% of students and recent graduates agreed with the statement that 'current programmes encourage students to be creative and innovative' 73 . 71.Recent discussions among international stakeholders and policy makers in higher education organised by the OECD 74 have highlighted that, while many higher education institutions have designed programmes based on new pedagogies with the explicit objective to stimulate students’ innovation skills, including creativity and critical thinking, significant challenges remain in this area. In particular, definitions and approaches to assessment of transversal attributes like creativity and critical thinking vary considerably between individual academics, teaching staff lack knowledge on effective pedagogical techniques to stimulate these skills and institutional structures, focused on research, do not necessarily provide conducive frameworks for increased focus on creativity. 72.The capacity of higher education institutions, their staff and students to engage actively in activities to support innovation in their localities and regions depends both on the culture and will within the HEIs concerned and the broader innovation capacity of the locality or region. The EU's regional innovation scoreboard, which provides a broad indication of the existing innovation capacity of EU regions, illustrates the extent to which higher education institutions across the EU are working within very different contexts. 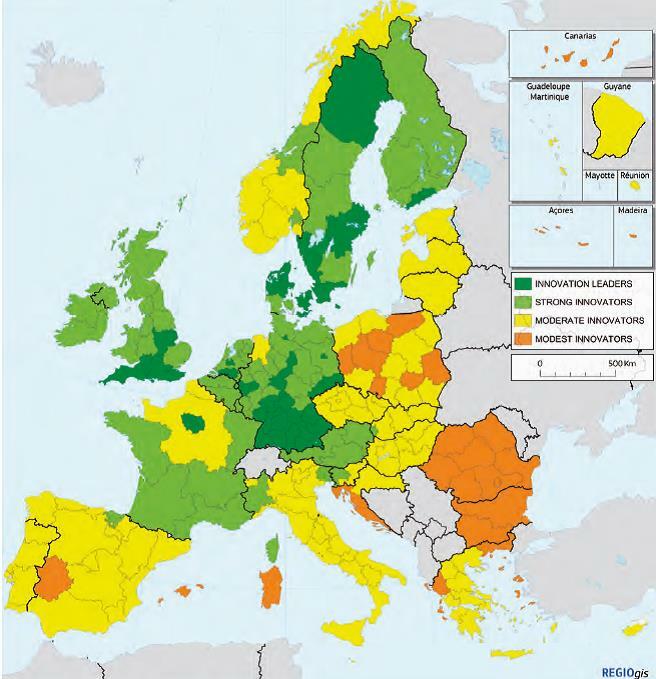 While Europe's most innovative regions lie primarily in northern and western Europe, innovation capacity in regions in the east and south of Europe is considerably lower. These different starting points naturally have an influence on the appropriate strategies, which may include a focus on stemming brain drain, for HEIs in the regions concerned. 73.Proximity between creative people and close networks of cooperation between knowledge-intensive organisations – including HEIs and business - are an important factor in fostering regional innovation. Available indicators show that existing patterns of cooperation between higher education and innovative businesses vary considerably across the EU. 74.The last Community Innovation Survey (CIS), undertaken in 2012 75 , identified enterprises that were undertaking some form of product, service or process innovation and then asked representatives of these organisations about the cooperation with external partners, including higher education institutions. In all countries surveyed, large companies reported that they cooperated on innovation with universities or other HEIs more frequently than small and medium-sized enterprises (SMEs). Moreover, whereas over or around 20% of SMEs in Finland, Slovenia, Austria and the UK reported that they cooperated with universities, the figure was 5% or less in Italy, Malta, Romania and Bulgaria. 75.More qualitative work examining the ways HEIs can contribute to regional economic development and Smart Specialisation Strategies has highlighted the main barriers the higher education sector faces in these areas. Higher education policy in many countries still lacks a territorial dimension, meaning there might not be strong incentives for HEIs to engage in activities to contribute to innovation at regional level. In structurally weaker regions, even if there is a comparatively strong university, there may be limited 'absorptive capacity' in local businesses to cooperate effective with academic partners. And within individual universities, the focus on regional innovation very often depends on individual institutional leaders and academic staff, rather than an institution-wide strategy 76 . 76.Higher education institutions increasingly recognise that they must afford young minds the opportunity to develop skills that inspire, encourage and enable innovation. Although it is difficult to make explicit links between specific skills and innovation, there is a move towards rethinking education and training programmes to promote the combined skills of creative and critical thinking, entrepreneurship, problem-solving, risk-taking and resilience, management, communication, exploiting the results of research and independent analysis. Promoting, assessing and rewarding these skills sets in higher education, alongside acquisition of detailed subject knowledge, is one of the challenges faced by teaching staff across Europe. 77.A step in this direction is the FINCODA project 77 led by Turku University of Applied Sciences that aims to develop a tool to assess students' 'innovation competences' during their studies and comprises a plan for training teachers to use the criteria. A further extension of FINCODA thinking is an initiative by the European Institute of Innovation and Technology's (EIT) Climate-KIC to develop a framework that defines essential innovation competencies and describes quality standards to develop and measure them respectively. This aims to create a pan-European standard for assessing innovation and entrepreneurship skills, with a focus on the climate change field 78 . 78.More generally, the OECD has started a strand of work to develop and refine our understanding of how creative and critical thinking skills can be developed and assessed in an educational setting. Currently focused on schools, the project Assessing creative and critical thinking skills at school (CREASSESS), will serve as inspiration for further work to explore how to promote creativity in higher education. 79.The concept of the 'entrepreneurial university' has been developed to describe HEIs that are making a conscious effort 'to empower students and staff to demonstrate enterprise, innovation and creativity' and that are dedicated to creating public value through processes of open engagement 79 . To assist universities to develop closer links between their education, research and engagement missions and to develop and strengthen partnerships with businesses, the European Commission and the OECD have developed and implemented the HEInnovate tool. 80.Public policy also has an important role to play in opening up universities to their “third mission” and in building synergies between research and education. In Sweden, for example, the higher education act of 1997 made interaction with surrounding society an official part of the mission of Swedish institutions for higher education (HEIs). In support of HEIs’ efforts to adopt a more systematic approach to societal interaction and leverage collaboration with other actors to strengthen the quality of research and education, Swedish policy makers and agencies have been working to support efforts to develop universities’ interaction with society. The 2016 Swedish research and innovation bill announced the addition of cooperation with surrounding society in addition to publications and external funding, as a quality indicator for incentivisation of HEIs. 81.Knowledge intensive, innovative activities have a tendency to concentrate in ‘core’ areas rather than peripheral ones. The development of smart specialisation strategies in the regions as an ex-ante conditionality for ESIF investment in research represents an important step towards the implementation of spatially-targeted, contextually specific policies to promote knowledge-based growth in the European regions 80 . 82.In this context, higher education institutions have the opportunity to co-design and help implement smart specialisation strategies, bringing together education, research and innovation and helping to convene other regional actors in the innovation systems. The Higher Education for Smart Specialisation (HESS) project 81 , led by the European Commission's Joint Research Centre aims to help build innovation capabilities by strengthening the role of HEIs in regional partnerships and to promote the integration of higher education in regional smart specialisation policy, particularly in the use of European Structural and Investment (ESI) Funds. 83.Higher education is being called on to do more: to improve performance in its core teaching and research missions; engage with society; and to develop newer roles, in areas like adult learning and innovation. This puts pressure on HEIs, their staff and those responsible for steering higher education systems to find and allocate resources effectively for different activities, and to demonstrate the money spent delivers good results. 84.The pressure to demonstrate results has increased in an overall context where spending on higher education – as in other parts of the public sector - is under pressure. 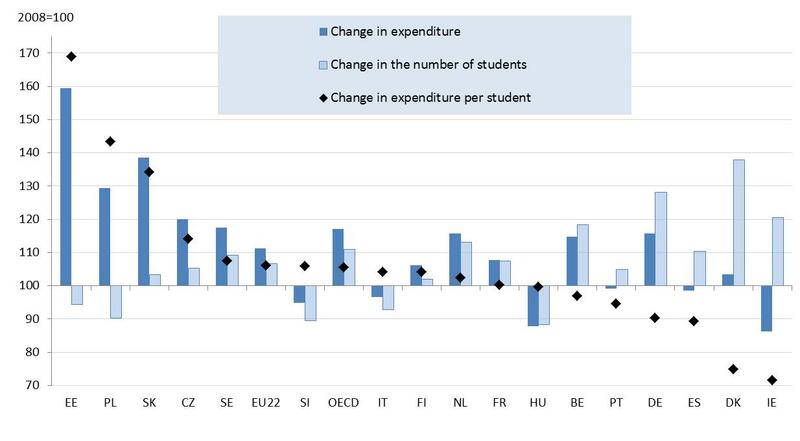 As shown in Figure 6.1, between 2008 and 2013, the OECD calculates that spending per higher education student fell in real terms in six EU Member States for which it has comparable data 82 . The European University Association's Public Funding Observatory 83 also pinpoints ongoing cuts in public spending per student in other countries including Greece and Latvia. 85.These relative changes mask considerable underlying differences in the level of resources being invested per student. 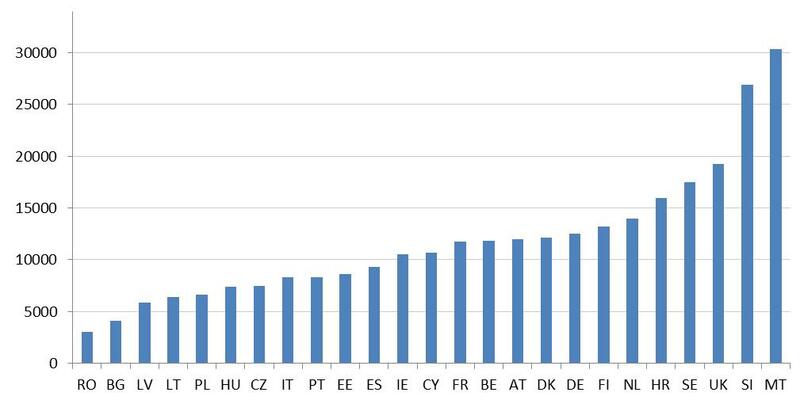 Figure 6.2 shows the public and private spending on higher education institutions per full-time equivalent student in euros adjusted by purchasing power standards (PPS). These data reflect the funds flowing into higher education institutions, but do not include public or private funds allocated directly to students, for example as student grants or public subsidy for student loan systems. 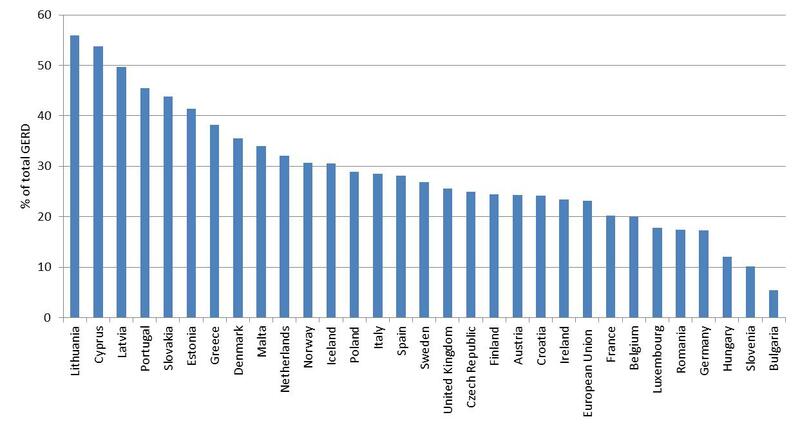 When the differential cost of living in different Member States is taken into account in this way, the highest rates of spending per student is seen in Malta and Slovenia, followed by the UK, Sweden, Croatia and the Netherlands. The lowest rates of spending, as seen in Romania and Bulgaria, followed by Latvia, Lithuania and Poland. 86.Even in well-funded systems, finding appropriate indicators to measure performance and designing appropriate policy measures to improve performance levels has proved challenging. In most higher education systems, there has been an increasing focus on the quality of research outputs, where a range of bibliometric measures and peer review techniques are routinely implemented. However, governments and institutions have typically paid less attention to measures of the quality of education and outreach and engagement activities. This is one of the reasons for a widespread perception that these activities are comparatively neglected in national funding and quality systems and in institutional strategy setting 84 . 87.Effective funding, quality and reward systems are important features of modern, effective higher education systems. Designing such systems is a shared challenge for all EU Member States, with the question of how best to incentivise and reward good teaching high on the agenda in many countries. A number of initiatives in Member States in recent years may hold clues to how to develop better framework conditions for effective higher education. 88.In recent years, there has been a general shift towards systems that pay universities based on the outputs they produce (number of graduates, number of research publications etc), rather than purely on the basis of established costs. At the same time, a number of countries have introduced performance contracts between the state and higher education institutions which established specific targets, the achievement of which may be rewarded with funding. Output-based funding formulas and performance agreements with funding linked are types of 'performance-based funding' (PBF). 89.The move to performance-based funding has generally been relatively recent and different models have been implemented in different EU countries. These reforms have now started to bed in and their impacts have started to be felt. A common trend has been to introduce specific contracts or performance agreements between the state and individual higher education institutions, which may or may not be linked to funding. 90.Although learning and teaching have always been at the core of university activities, the emergence of more competitive research funding and international university rankings based on research performance accentuated a widespread perception that teaching was (and is) a comparatively neglected activity in higher education. At the same time, as highlighted in section 3 of this paper, good teaching is crucial if students are to acquire the knowledge, skills and experience they need. It was against this backdrop that the EU's High-level Group on the modernisation of higher education examined the issue of promoting quality in teaching and learning in higher education institutions and produced it 2013 report 85 . 91.In their findings and recommendations, the High Level Group argue that ensuring quality in teaching and learning requires action by everyone involved in the higher education system at different levels: by governments and system regulators, by higher education institutions, by staff and by students. While the role of leaders of higher education institution is singled out as particularly crucial, the High Level Group also recommend that 'Public authorities responsible for higher education should ensure the existence of a sustainable, well-funded framework to support higher education institutions’ efforts to improve the quality of teaching and learning'. The Group also argues that teaching performance should be a factor in recruitment and progression decisions in higher education, which are in many countries affected by system-wide regulations and conventions 86 . 92.The question of rewarding quality and creating parity of esteem between teaching and research activities in higher education is also intrinsically bound up with the question of how teaching and research should be inter-related. As highlighted in a recent report by the League of European Research Universities (LERU) 87 , there are concerns that teaching and research too often operate in parallel worlds that rarely meet, including in research-intensive universities. To address this, higher education institutions and government agencies involved in funding research and higher education are increasingly exploring ways to strengthen the link, with more research-based teaching and greater involvement of students in research. 94.Transparency tools are needed to benchmark HEI performance for institutional strategy setting and to communicate information on higher education institutions to students choosing between specific educational programmes, to public or private agencies awarding research contracts, to governments deciding on accountability issues relating to funding and for regional and international engagement of higher education institutions. From this perspective, the European Commission has supported the development of U-Multirank, an independent multi-dimensional international ranking system and a European Tertiary Education Register (ETER). 95.U-Multirank 88 is a multidimensional, user-driven approach to international ranking of higher education institutions. It compares the performances of higher education institutions in the five broad dimensions of university activity: (1) teaching and learning, (2) research, (3) knowledge transfer, (4) international orientation and (5) regional engagement. The U-Multirank web tool enables comparisons at the level of the university as a whole and at the level of specific fields of study. Based on empirical data U-Multirank compares institutions with similar institutional profiles (‘like-with-like’) and allows users to develop their own personalised rankings by selecting indicators in terms of their own preferences. 96.The European Tertiary Education Register (ETER) 89 is a database of higher education institutions in Europe providing data on the number of students, graduates, international doctorates, staff, and fields of education, income and expenditure as well as descriptive information on the characteristics of the institutions. The collection of data is done in partnership with National Statistical Authorities, but publication of the data is done independently. 97.The tools were developed organically and independently over time. As further development, these tools will be components of a 'Knowledge Hub for Higher Education' to create synergies across the knowledge tools and other higher education research projects piloted by DG EAC. The Knowledge Hub, to involve the Joint Research Centre, will gather the knowledge tools to optimise management and funding mechanisms, to ensure optimal synergies and interoperability between the tools, to minimise overlaps in data collection, to improve communication of results at European and national level, and to support better policy-making based on the data collection and evidence behind the tools. 98.The table below provides an overview of the EU-level actions included in the renewed EU agenda for higher education. Any activities would be part of 2018-20 Horizon 2020 Work Programme (expected adoption October 2017). CEDEFOP (2016a). Future skill needs in Europe: critical labour force trends, Luxembourg: Publications Office. CEDEFOP research paper; No 59. Davies, S., J. Mullan, P. Feldman (2017) Rebooting learning for the digital age: What next for technology enhanced higher education? Higher Education Policy Institute, UK. OECD (2016c) Education at a Glance 2016: OECD Indicators, OECD Publishing, Paris. The indicator 'job opportunities' is the sum of net change in total employment (expansion demand) and an estimation of replacement demand resulting from people leaving work places for different reasons. Through direct employment and expenditure in a location; student spending and employment; activities including technology licensing, consultancy, contract and collaborative research, spin-outs, and start-ups, research and science parks, workforce training and staff volunteering; and earnings premiums for graduates. These include the EU-funded CALOHEE project and the Measuring College Learning project in the US. Assessments of the likely impact of digitisation vary. Frey and Osborne (2013) estimated that 47% of US employment is subject to substitution (39% in Germany, 35% in the UK), whereas Arntz, Gregory and Zierahn (2016) put the figure at 12% (9% in Germany). See Flisi et al. (2016). A worker is considered well-matched if her ICT skills fall in between the minimum and maximum requirement of the occupation in which she is observed, as under-skilled if they fall below the minimum and over-skilled if they are above the maximum. Introducing, among other reforms, the three cycle structure and a greater focus on learning outcomes. Blended learning is an education program (formal or informal) that combines online digital media with traditional classroom methods.